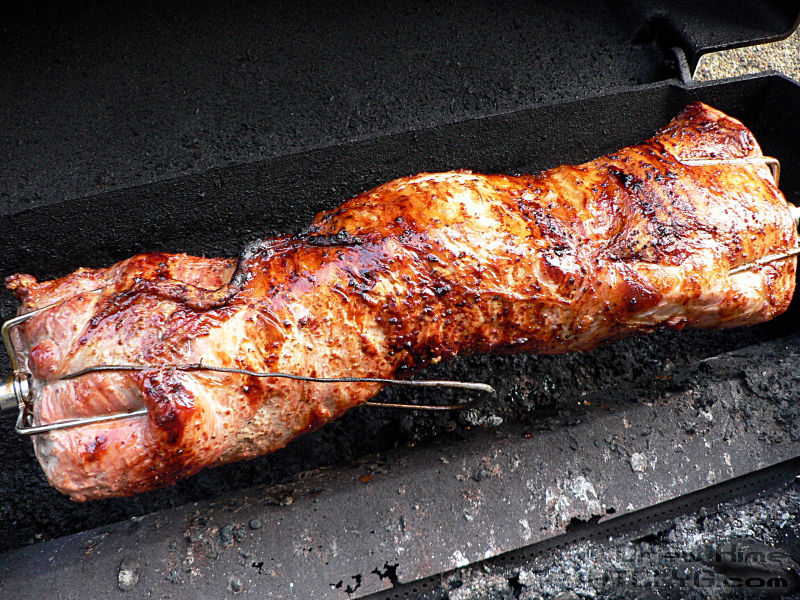 Go get a rotisserie. No seriously, they’re great. If you’ve been following along this summer, then you already know the actual cooking directions are pretty easy. But I’ve got a few tips today besides the cooking. 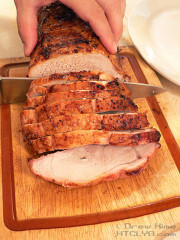 For instance, you can sometimes get a whole pork loin on sale for less than half what it costs for pork chops or roasts. You can freeze the whole thing still in the vacuum pack, or cut it up into chops and roasts and freeze them individually. If you freeze the whole thing, you might want to bend it a little first. That way, when it’s time to defrost it you can fit it in your sink and cover it with hot water to thaw faster. No, I didn’t actually think that far ahead. I just bent it to fit it on the shelf in the freezer, and it happened to come out exactly the right size to fit in the sink. FOOD SAFETY NOTE: Mindy, a 2nd-year culinary student, reminded me down in the comments that you should never use hot water to thaw frozen meat. Thaw in the fridge, or under cold running water. She’s absolutely right, of course. Just because I want this method to be as safe as the others doesn’t make it so. 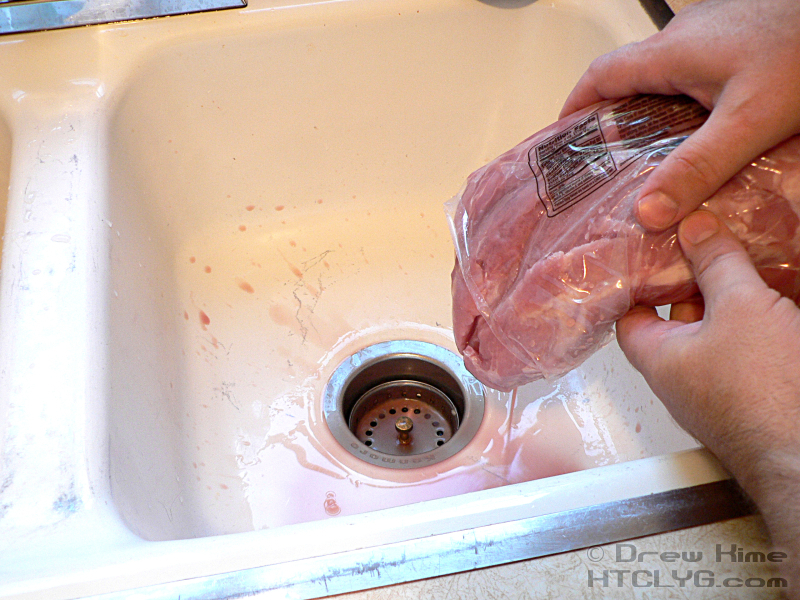 Once it’s thawed, cut the pack open and drain the liquid. They add liquid while packaging to add weight so it will cost more to enhance the moistness. 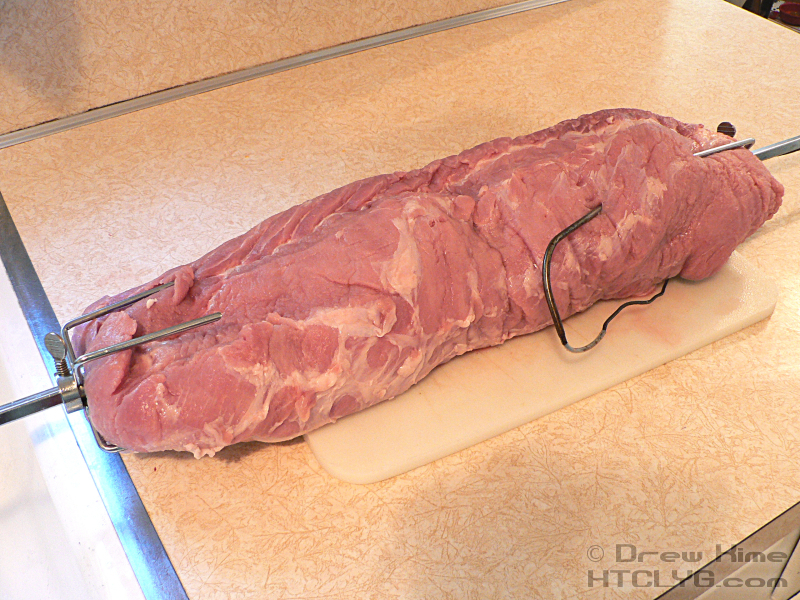 Run the spit lengthwise through the loin, with the probe from your digital thermometer into the thickest part. Before sticking the spit through, thread the probe for your digital thermometer through one of the forks, and through the collar that will rest in the bracket on the grill. 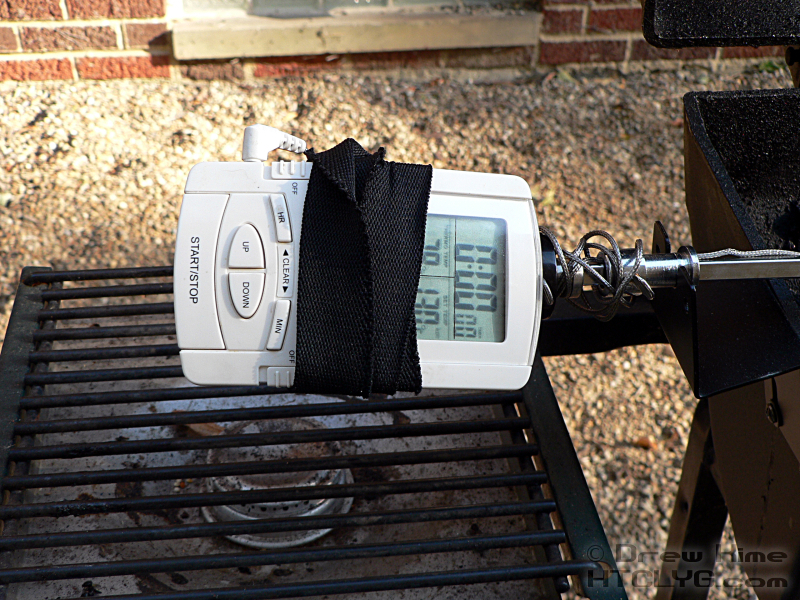 Attach the thermometer to the handle with rubber bands or elastic. 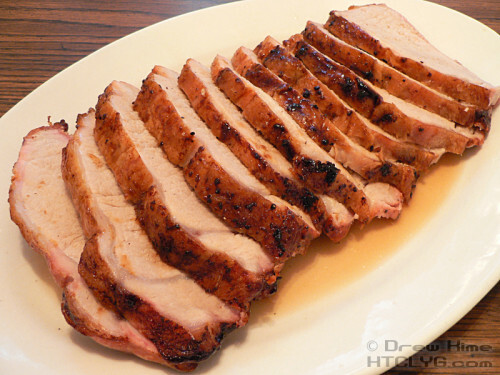 You can season the pork before putting on the grill or after. I like doing it on the grill. Just sprinkle it on as it goes around. Set the thermometer to go off about 130°. You don’t want to take it off the grill until it hits 140°, but this will give you about a five to ten minute warning to get everything else set. 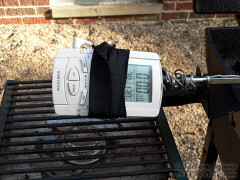 Turn the grill on as low as you can get it without shutting off. 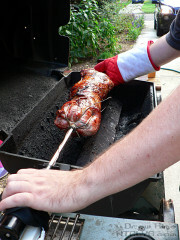 Once the juices start to run it’s going to keep flaring up, so you won’t need much fire from the grill. Close the lid and leave it alone. It should go for about an hour before beeping. When it does, you should see this. You can see here how low the flame is. You can also see how badly I need to replace the shield over the burner. When you take the spit out, don’t forget that it’s a metal rod that has been over a flame for an hour. Meaning it’s hot. Use a heavy-duty mitt. Don’t use some pretty, knitted oven mitt you got from your grandmother. The spit is heavy, and — unless you’re carving at a table outside — you’re going to have to carry it all the way into the house. I don’t think I’ve shown this yet. To keep the cutting board from sliding around, put a piece of rubber shelf liner under it. 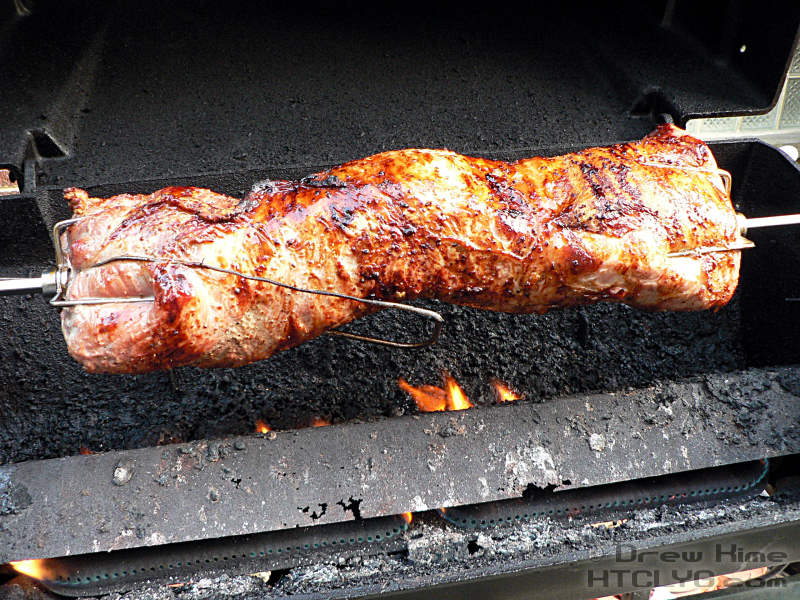 Let the meat rest for 10-15 minutes before carving it. 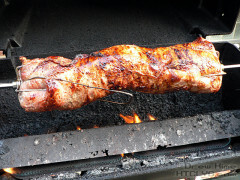 When it first comes off the fire, the temperature difference between the inside and outside of the meat is squeezing all the juice toward the center. If you cut into it, all the juice will run out. Let the temperature equalize before pulling out the spit and thermometer, then start carving. Slice some thick pieces and some thin, so people can choose how much they want. 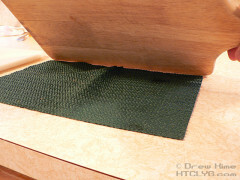 Note the groove on the cutting board that captures the juice that does leak out. 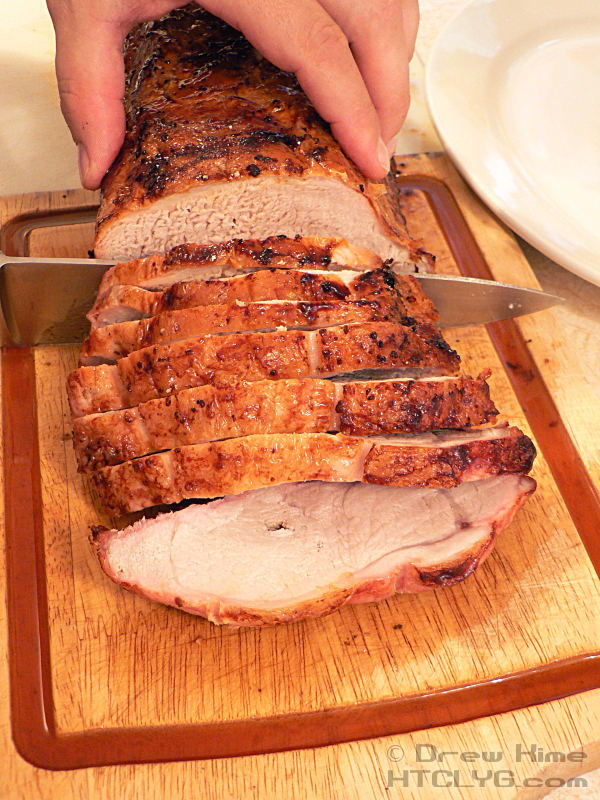 Lay the slices out on a platter, and pour over the juice from the cutting board. 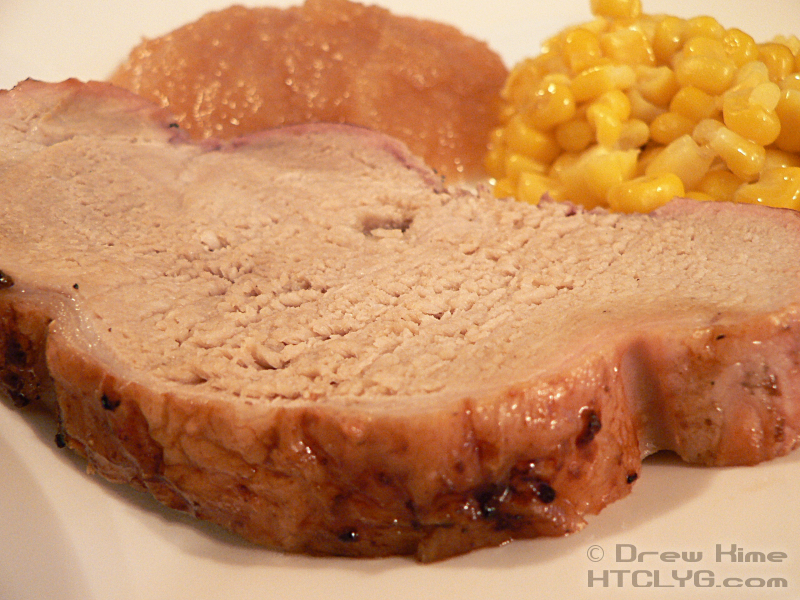 Serve with … well, pretty much anything, but I went with corn and apple sauce. 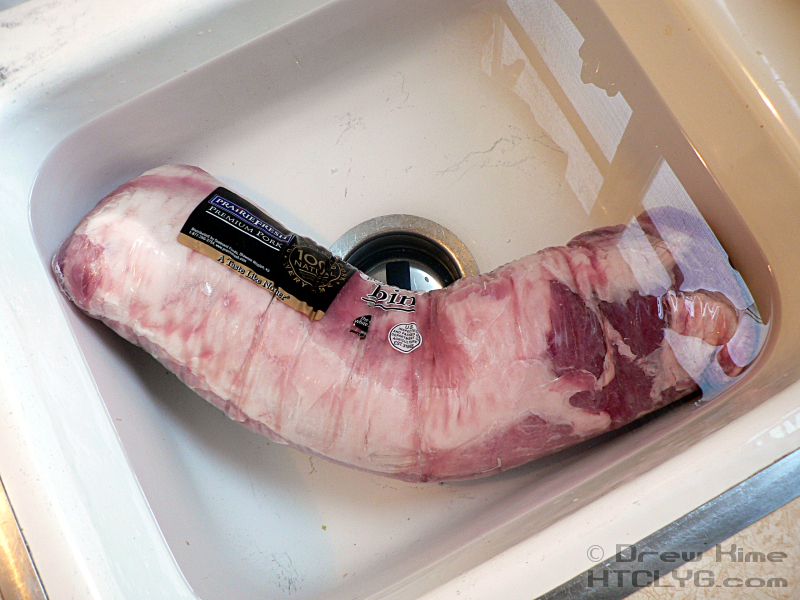 Rinse and dry the pork loin. Don't worry about trimming off any fat on the outside, it will all cook off. Run the rod for your rotisserie lengthwise through the center of the loin. 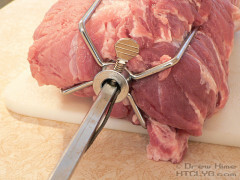 If you have a digital thermometer with a remote probe, insert it into the thickest part, at an angle so the back of the probe is right alongside the meat. 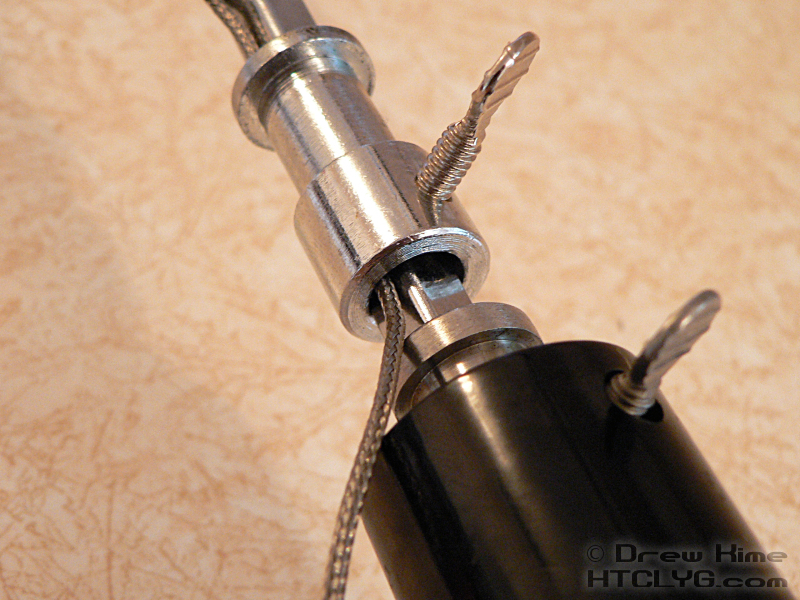 Run the wire through the bracket for the rod before putting the bracket on the rod. Attach the thermometer to the handle of the rod outside the grill. Place on the grill with the flame set as low as it will go without going out. As the meat makes its first rotation, coat it liberally with salt and pepper. Cook until the thermometer reads 140°. 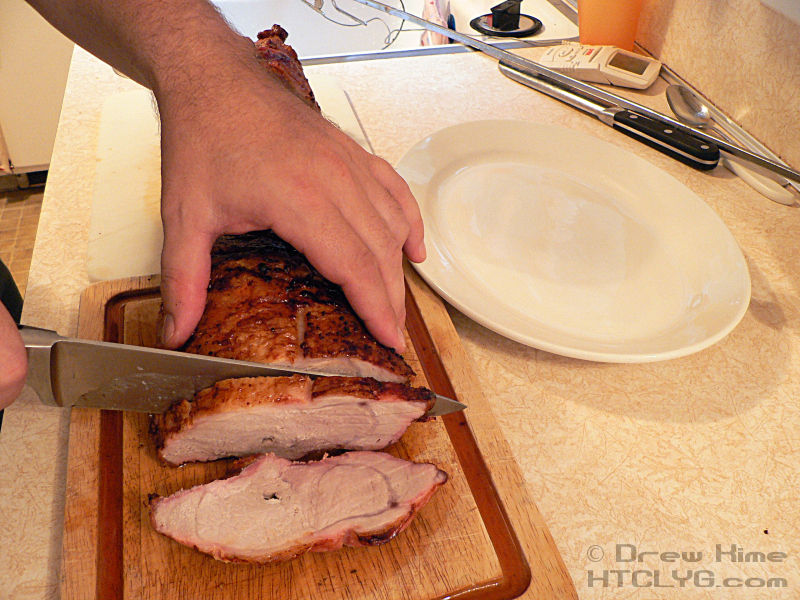 Remove from the grill and let it rest for 10-15 minutes before carving.